This spatial installation for ZigZagCity is an ode to the creative use of mundane everyday objects by skaters in the city. 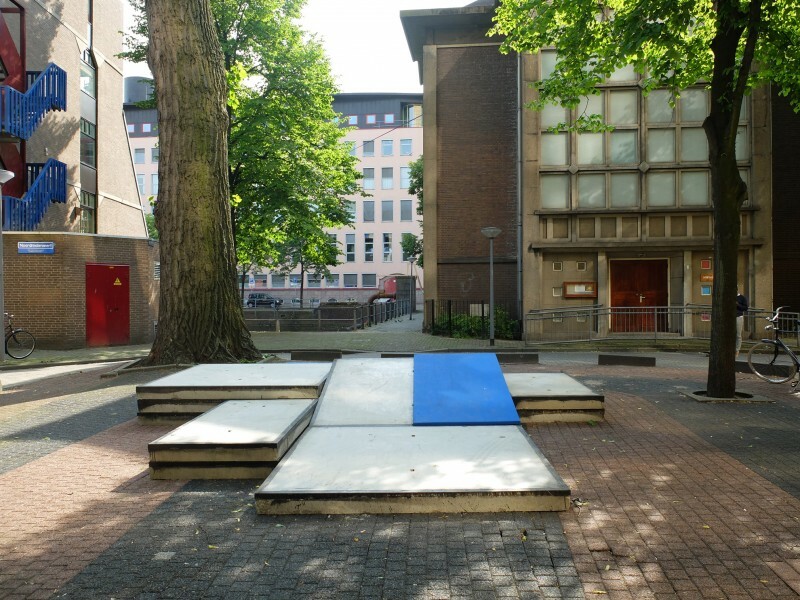 Skaters have developed their own view on their surroundings that breaks up the cityscape in pieces that are either non-skateable or skateable. Architectural styles, meanings, rules and codes are not taken into account. 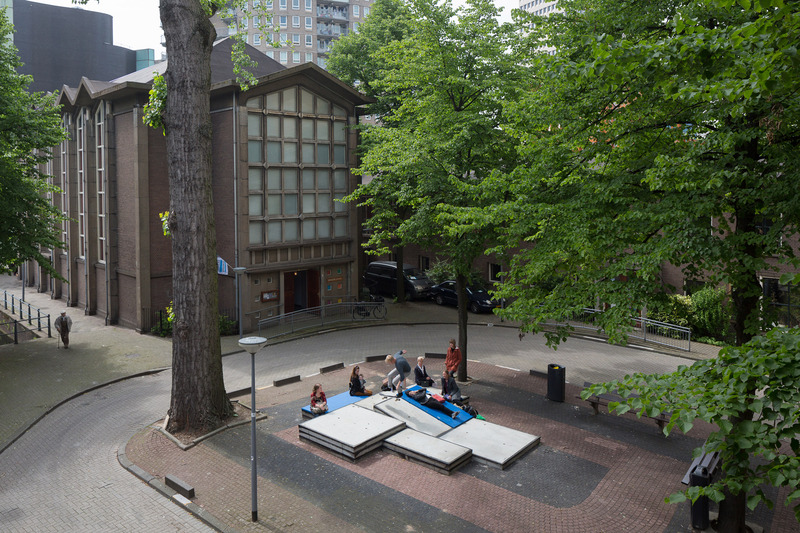 Buildings and streets are deconstructed in surfaces and shapes that provide opportunities for creative use. Therefore, skaters are some kind of architectural connaisseurs, focussing on edge details, slight level differences, material textures, patterns and surface inclinations. 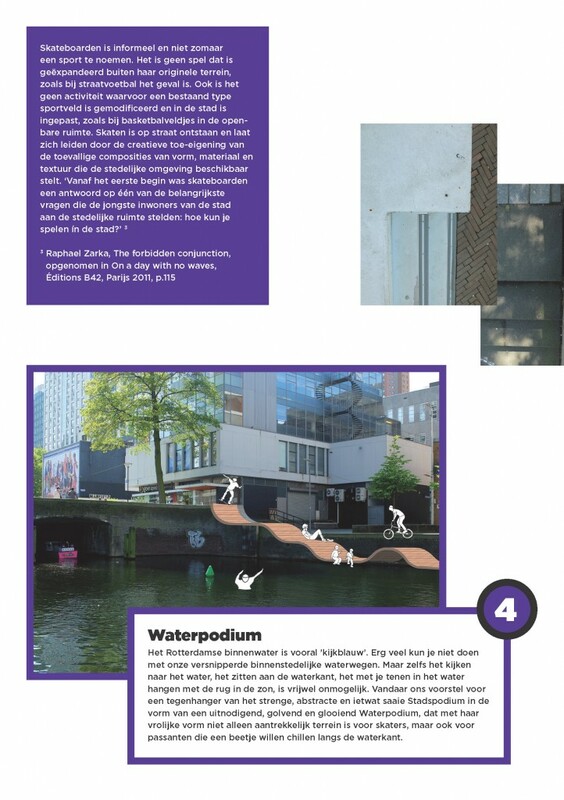 We applied this gaze to the design of a spatial installation for a leftover piece of street, a desolated island at the Noordmolenwerf in Rotterdam. This picturesque square is rudely intermitted by concrete blocks that make it impossible for cars to park. Subsequently, the current monofunctional setup with two benches in the corner does not seem to optimize the potential of this place. 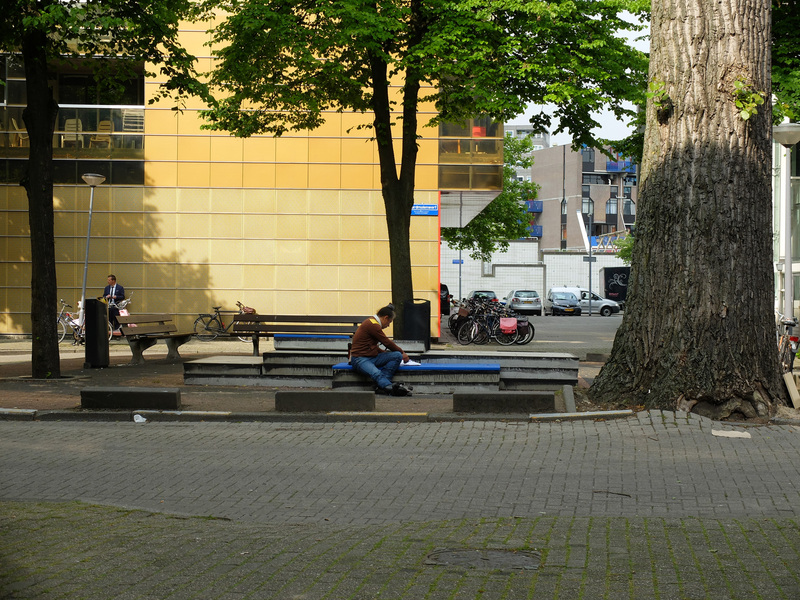 We figured it could use an inviting gesture that transformed the whole square into an inhabitable surface. 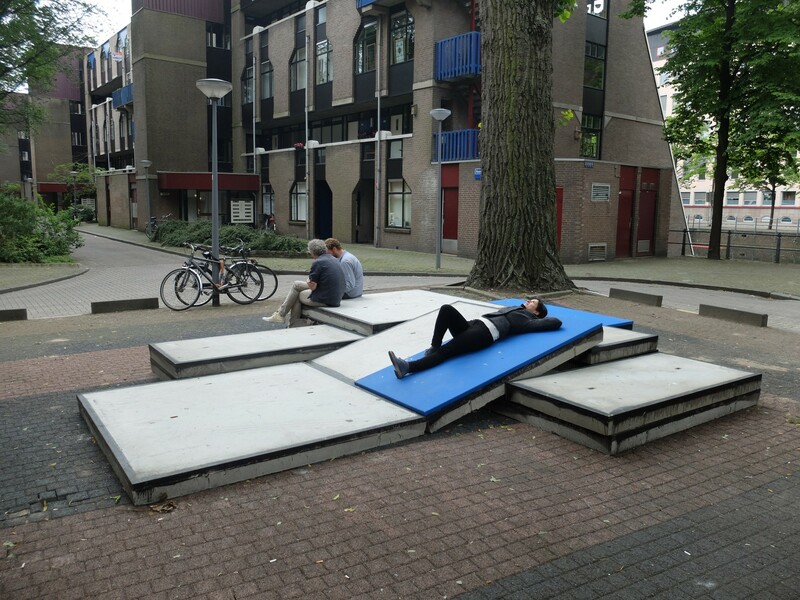 Therefore, we proposed an abstract sitting and playing landscape as a counterpart to the traditional benches, both in material, function and position on the square. The defensive concrete blocks around the square inspired us to use prefab concrete plates but use them in a positive, inviting instead of forbidding way, by stacking them in a curious composition of different heights and inclinations. 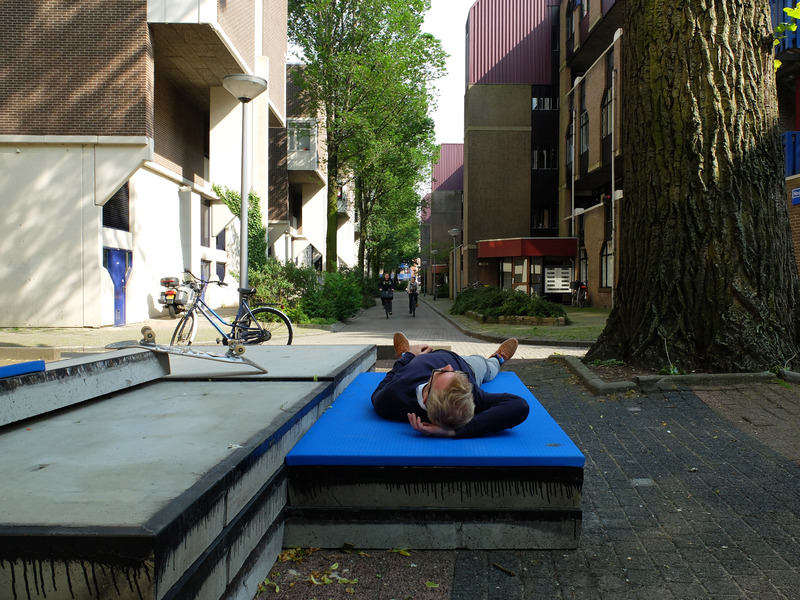 By adding soft judo mats, a visual and haptic distinction is made, inviting people to lie down, hang around or skate on the blocks. As a bonus, their blue colour happened to blend in with the background perfectly. Furthermore, the object is placed in the focal point of different views in the adjacent streets, opening up the square to the bigger picture surrounding it and emphasizing the hidden qualities of this neglected piece of the city. 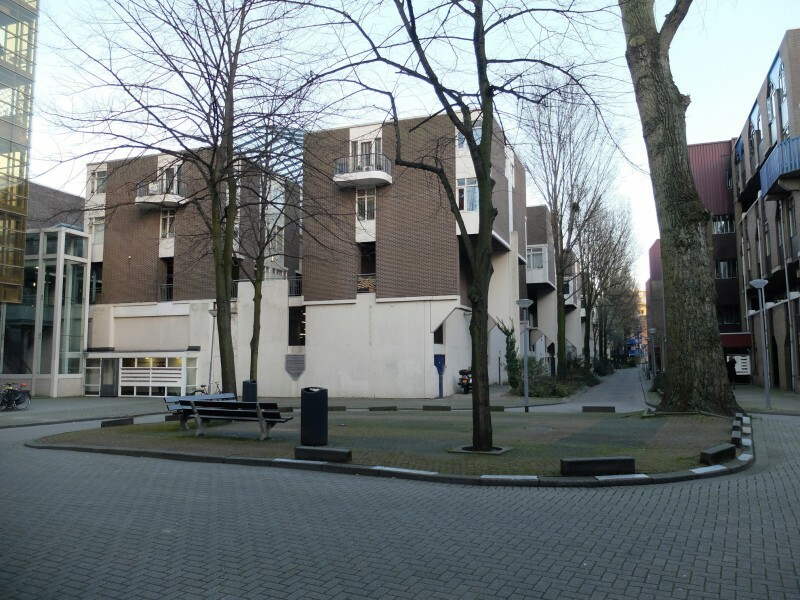 different types of pavement in the Laurenskwartier. Along this route, we made several design suggestions on paper as how to improve the latent spatial and useful qualities inherent in selected sites. ZitZatCity is the physical outcome of one such suggestion and we are very excited we got the opportunity to test this speculation and see how people react to it in real life. 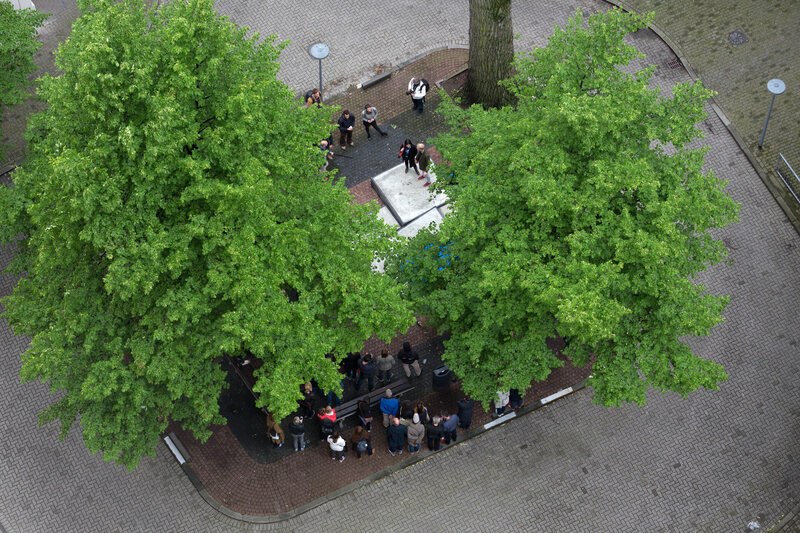 We mapped all the different types of pavement in the Laurenskwartier. Along this route, we made several design suggestions on paper as how to improve the latent spatial and useful qualities inherent in selected sites. 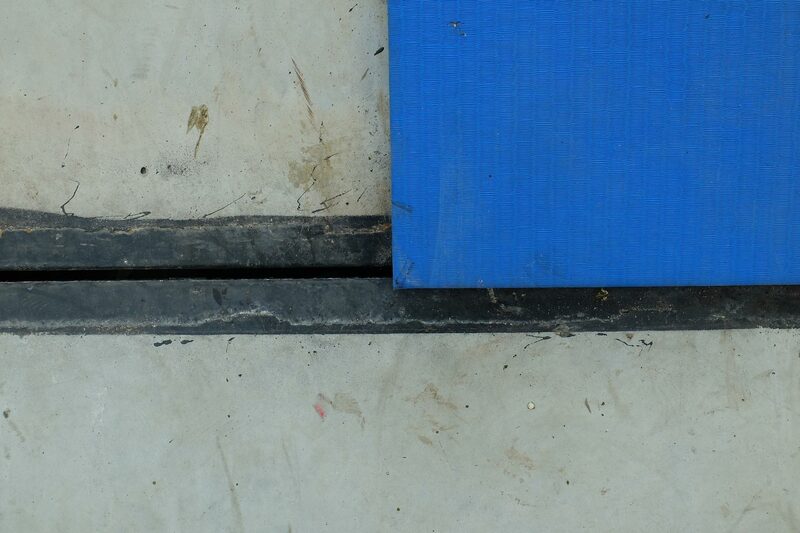 Click the fragment of our routemap to visit the ‘Door de ogen van LAGADO’ projectpage. Reactions were so positive that the installation was repositioned to and reconfigured for the ZoHo neighbourhood after the festival.